What we’re reading: The 24-year-old raising millions for Trump to "own the libs"
Charlie Kirk is the 24-year-old founder of Turning Point USA, a conservative nonprofit whose 130,000 members claim to be "culture warriors" in the fight "to save Western civilization" from liberals, writes Adam Rubenstein for The Weekly Standard. Why it matters: With more than 650,000 Twitter followers and the sworn fealty of some of Washington's most prominent conservatives, Kirk is a provocative firebrand whose proclaimed goal of "owning the libs" all-too-perfectly captures the present state of Donald Trump's base. Kirk's messaging and networking in conservative circles has been so effective, in fact, that he claims TPUSA will have raised $15 million by the end of 2018. The backdrop: Kirk founded TPUSA in 2012, opting not to attend Baylor University and instead use his "rhetorical gifts" to launch a conservative, youth-focused organization with the financial backing of investor Foster Friess and Bruce Rauner, now the Republican governor of Illinois. 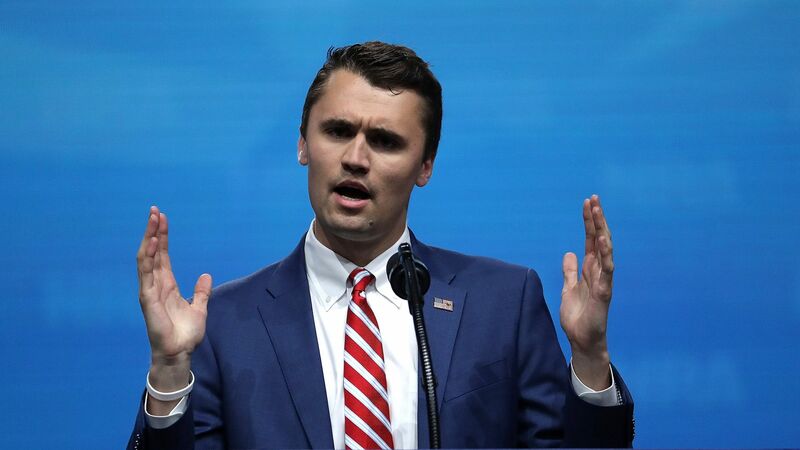 TPUSA quickly grew to more than 300 chapters at colleges across the country, thanks in part to Kirk's cabinet of deep-pocketed advisers, writes Rubenstein. The group brings speakers to campuses, encourages conservative students to run for office, and sells memorabilia with slogans like, "Taxation Is Theft," "Facts Don’t Care About Your Feelings," and "You Are Entitled to Nothing." Kirk claims to have spent around 90 days straight campaigning with Donald Trump Jr. in the run-up to the 2016 election, with his perceived closeness to the Trump family providing another significant boost to his brand. "If there’s one person this president admires, it’s Charlie Kirk," said House Majority Leader Kevin McCarthy. TPUSA hosts a handful of highly-attended events, with the most recent being a four-day High School Leadership Summit that began on July 23. Past speakers and guests have included Trump Jr., Education Secretary Betsy DeVos, Fox News' Jeannine Pirro and Sebastian Gorka, "Mr. Brexit" Nigel Farage, and NRA spokeswoman Dana Loesch. Attorney General Jeff Sessions made headlines at the most recent TPUSA summit when the crowd he was addressing erupted in a "Lock her up" chant. "Few things rouse the group as much as a Hillary punch line," Rubenstein writes. The big picture: Critics have called Kirk a provocateur — pointing to misleading and outright false tweets that drum up outrage like, "83%, 10 out of 12, of all rapes in Denmark are committed by migrants or their descendants." But the reality is that Kirk's influence in Trumpworld is unbridled, and as the 24-year-old leader of a growing movement of right-wing, "own the libs"-driven populism, he won't be disappearing anytime soon.